Squirrels are happy, bouncy, social creatures. Friends may possess some of the same qualities when these are eaten. 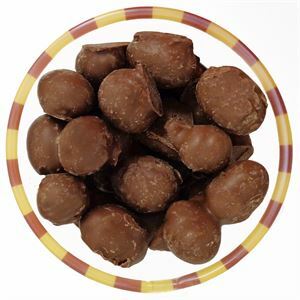 A crunchy peanut covered in thick milk chocolate. Use this candy to trap new friends. From Anonymous of Columbus, Wisconsin on 12/6/2017 . I received the squirrel bait as a gift. I can't stop eating it. I am a fan and will spread the word to my fellow Sconnies.